Ray Liotta is Robbins, an ex-marine and full time rebel deemed ‘too surly’ for a regular penitentiary in a future (2022!) where the prison system has become privatised. The move to Absalon is accompanied by an sentence that offers no parole and no release, only gradual doom. Robbins doesn’t like the look of the new venue nor the sound of his future. So he escapes. Again. In embarrassingly easy manner. It turns out a lot. 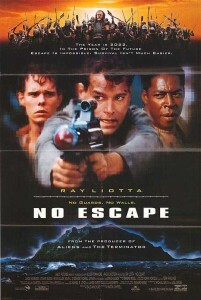 This is one of the rare ‘one guy against the world’ films from the 90s not starring Kevin Costner. Ray Liotta frankly looks confused as to who he is to point his eyebrows at next. Crazy grandpa steals his scenes but is such a strange and incongruous character that you wonder if he belongs in another film. Only Lance Henrickson seems at home, given he is a veteran of B movies and has long since worked out how to coast. The film is as patchy as it sounds, and even though it ends up exactly where you know it will I cannot for the life of me recall how it got there. Nor do I for one second care. No Escape (from Absalon) is a familiar story cross bred with another familiar story. The Lord of the Flies crossed with Fortress crossed with The Island of Dr Moreaux, which is ironic because that too was about mixing things that should not be mixed. Final Rating – 6 / 10. Never has so much activity and so much money culminated in so little of anything.